How would you explain your day-to-day? Well, every day is different depending on what's going on in the office. I usually try to get basic administrative stuff done when I first get in - pick up the mail, manage emails, and of course, say good morning to everybody! I help out anywhere people need it. One day I'll be busy scheduling appointments with investors, the next I'll help with shipping labels, filing, and scanning. The more we work as a team, the faster we accomplish our goals. I know a lot about the company and different departments because I really try and make sure everything runs smoothly. Most importantly, I try to maintain the office appearance. When we have visitors it's my job to give them the best first impression, so having the office look good is vital! What should people know about Voxox? Voxox makes chatting on different networks really convenient - that's my primary use for Voxox. I have friends on Voxox, Google Chat, and Facbeook that I talk to, and Voxox lets me have them in one window instead of switching back and forth between pages... no more blinking tabs or overlooking messages! Being able to switch from chatting to texting in the same window is really cool to me, too. With Voxox you can program in your friend's number and their screen name all under their contact card, so if they leave their computer you can keep the conversation going by sending texts from Voxox to their cell. What's your greatest accomplishment since you've been with Voxox? No one before me took ownership of the job. They just did the basics - answered the phone, filled the printer, etc.- but I've really put in the effort to streamline processes and shop around to find the best deals on things we need like office supplies and shipping, as well as stuff we all want like coffee! It's really about personal pride. I've always been that way. I take a lot of pride in my work, even if people don’t notice, I notice. I do what I can! Do you have any hidden talents or hobbies? Lets see, I'm pregnant... does that count as a talent? No? Ok, well I love to paint, dance, and sing - anything artistic and expressive. I used to paint a lot, but now that I'm getting everything ready for my baby I haven't really had time. I'm trying my best to finish a set of paintings I've been working on for her nursery, I'm so excited! I'm trying to learn how to do things around the house too. My husband and I just renovated our kitchen by ourselves, we're becoming our own interior designers! When I was in high school I used to be in the show choir; it's like performing short skits through singing and dancing. My favorite song was Footloose, it was just so fun... get footloose!! All the spinning and jumping requires a lot of coordination, which is is difficult for me sometimes. I never fell though, which is impressive. Also, my arms do a funky double jointed thing that always gets a lot of laughs and I've never had a cavity. Last restaurant you ate at? Souplantation. I had salad, clam chowder, ice cream - I always get the ice cream - and fruit. I'm allergic to gluten so it's kind of limiting. Well, the clam chowder isn't gluten-free, but it's just so good I had to have it. What's the wallpaper on your cell phone? Right now, it's a bridge and clouds. Let me explain. My grandma sends me lots of emails. She forwards me things like LOLCats, pictures of cats and unicorns hugging, "The People of Wal-mart" links, and slide shows of nature scenes. It makes me think of her and how proud I am that she is never afraid to try new things, even at 78 she isn’t scared of technology. She never stops learning, and I admire her so much for it.. Your most embarrassing moment? When I was a freshman in high school I had a huge backpack and one day I was trying to shimmy over a short fence and, of course, I fell over in front of a bunch of Senior guys. I stood up, said, "Thank you. Thank you," and took a bow. My policy is: if you can’t laugh at yourself, someone else will do it for you! Now that you know a little more about Heidi's show-tunes past and her love for clam chowder, we want to know what you think about her! 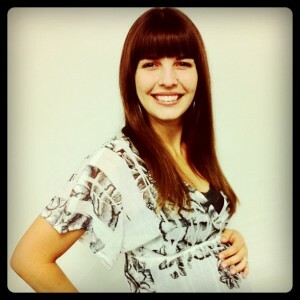 As her baby bump gets bigger, more and more bets and predications around the due date have been circulating the office. Get in on the action and take our poll to see if you can predict when her baby will arrive... we'll let you know the results as soon as she shares the great news! When will Heidi's baby arrive? If you want to know more about Heidi or have any questions you want us to ask our next Voxox rock star, let us know here or on our Facebook page!